208 pages | 39 B/W Illus. Wind Power looks at the nations, companies and people fighting for control of one of the world’s fastest growing new industries and how we can harness one of the planet’s most powerful energy resources. The book examines the challenges the sector faces as it competes for influence and investment with the fossil fuel industry across the globe. 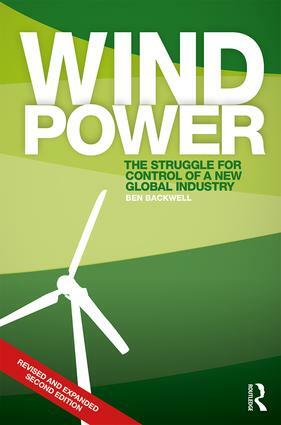 Over the course of this volume, Backwell analyses the industry climbers, the investment trends and the technological advancements that will define the future of wind energy. This second edition is revised throughout and contains new material on frontier wind markets and industry consolidation, as well as the cost reductions and market gains that led to 2015 being a landmark year for the big wind turbine companies. Ben Backwell has spent most of his career covering international energy markets and finance. He worked for international news agencies and as an analyst in Houston, Caracas, New York, Rio de Janeiro and Buenos Aires before moving back to his native UK in 2006. He then worked as an analyst covering major oil companies before joining renewable energy news service Recharge, becoming Editor-in-Chief in 2012. He joined FTI Consulting as a Managing Director in 2015 after taking part in the creation of the Solution Wind advocacy campaign ahead of the COP21 climate negotiations. He holds a master's degree in Politics from the University of London.